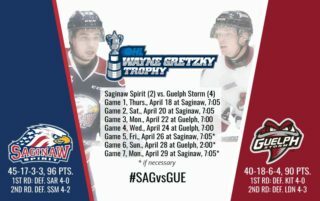 Windsor, ON – The Saginaw Spirit (32-14-2-2 68pts.) look to build on two-game win streak Thursday, February 7 in the final season meeting against the West Division rival Windsor Spitfires (21-27-3-1 46pts.) 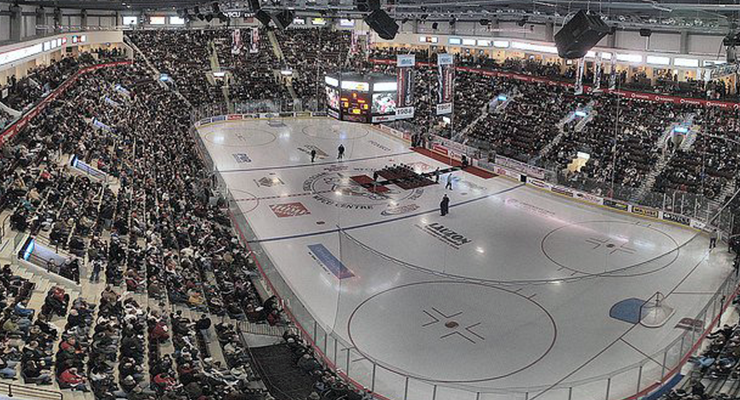 Puck drop is set for 7:05 p.m. from the WFCU Centre. Saginaw has gone 3-0-1-0 after dropping the first three games against Windsor this season. 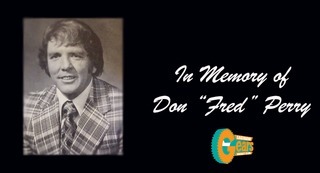 Fans can follow all the action on the flagship WSGW 100.5 FM Talk and Sports and www.fmtalk1005.com with Joey Battaino and Dennis Desrosiers on the call. “Countdown to Face-off” begins 15 minutes prior to puck drop for all your pregame coverage. 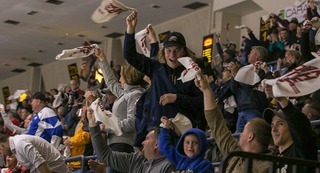 The Saginaw Spirit are on pace for 43 victories this season, one win off Spirit team record 44 wins during the 2006-07 season. This Spirit team featured future NHLers Tom Pyatt, T.J. Brodie, Jan Mursak, and Cody Bass. 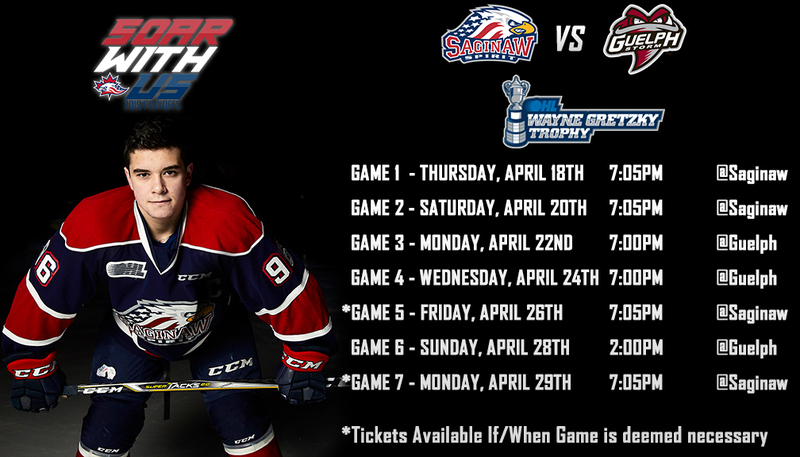 The Spirit are coming off a home-and-home series against Flint Firebirds. Saginaw defeated Flint in both outings to continue the season dominance against their in-state rival. Saginaw’s Camaryn Baber was honored in both games against the Firebirds with multi-point outings in each victory. The second-year center notched a goal and assist in both games. Baber, along with Jake Goldowski and overager Albert Michnac, is apart of the Saginaw’s fourth forward line which has arguably been the Spirit’s best line over the past two weeks. Michnac was honored with Saturday’s first-star against Flint after his two-point outing. The Czech forward has been one of the Spirit’s main contributors this season with 14 goals and 30 assists. Michnac has two goals and five assists in the seven games this season against Windsor. Saginaw’s break out rookie Cole Perfetti comes into Thursday’s game riding a four-game point-streak. Saginaw’s 2018 fifth overall pick is among the top in all major scoring statistics among rookies. 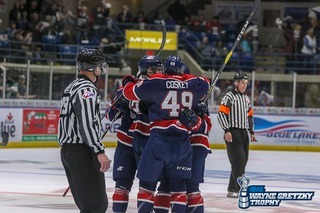 Cole Coskey leads all Saginaw Spirit players in both goals (28) and points (59). 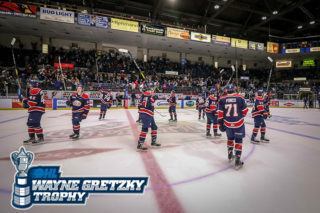 The Zion, Illinois native passed Grand Rapids Griffins forward Dylan Sadowy for 12th all-time in points as a Saginaw Spirit against the Firebirds. Edmonton Oilers prospect Ryan McLeod got back on the scoresheet in Saturday’s victory against Flint with an assist. The 2018 NHL 40th overall pick has been a consistent contributor since being acquired from Mississauga before the trade deadline. During a two-day stretch the Saginaw Spirit made two of the biggest trade deadline splashes when they acquired McLeod and Owen Tippett in two separate trades. Tippett, the 2017 10th overall pick of the Florida Panthers, has 22 goals through 36 games this season. New York Islanders prospect Bode Wilde is second on the Spirit with 51 points this season. The former University of Michigan commit ranks third among OHL defensemen in points, behind just Peterborough’s Ryan Merkley and Sault Ste. Marie’s Mac Hollowell. Wilde, a 2018 second round pick of the Islanders, signed an entry-level contract with the club earlier this season. 2018 NHL Draft prospect Daniel D’Amico leads all Windsor Spitfire players with 43 points this season. D’Amico has been strong against the Spirit this season with five goals and two assists through seven games. Two of Windsor’s main contributor’s this season has been rookies Jean-Luc Foudy and Will Cuylle. Foudy ranks third among Windsor Spitfires with 39 points and first with 34 assists. The Scarborough, Ontario native was selected 10th overall by Windsor in the 2018 OHL Priority Selection Draft. Cuylle is second on the team with 22 goals this season, just one goal behind Windsor’s goal leader Cole Purboo. The former Peterborough first round pick was acquired by the Spitfires before the season. The Spirit boasts eight players drafted by NHL clubs, forwards Brady Gilmour (Detroit Red Wings), Blade Jenkins (New York Islanders), Owen Tippett (Florida Panthers-signed), Ryan McLeod (Edmonton Oilers), Damien Giroux (Minnesota Wild), defensemen Reilly Webb (Detroit Red Wings), Bode Wilde (New York Islanders-signed), and goaltender Ivan Prosvetov (Arizona Coyotes). The Spirit returns home Saturday, February 9 to take on CHL’s third ranked London Knights for McLaren Mental Health Night. Puck drops for the teams second meeting of the season at 7:05 p.m. from The Dow Event Center.